Every year in Austria there are two pristine summer sporting events that everyone has to be seen at. One is the Formula One Grand Prix at the A-1 Ring and the other is the FIVB Beach Volleyball World Tour Grand Slam at Klagenfurt. With a party reputation second to none, the Austrian Open is everyone's favourite stop on the Beach Volleyball World Tour and everybody who is anybody is determined to be seen there. It's definitely got the players vote as the top Beach Volleyball venue and it's not hard to see why. Dancing, chanting, cheers and screams are all synonymous with the tournament and that's just from the players. Six days of thrilling, world-class on court action, watched by sun-baked galleries in a unique festive atmosphere that never stops. And it's just the perfect ingredients to draw the crème de la crème of Austrian highlife to this unique lakeside event. Ask those in the know: If it's August, it must be Beach Volleyball at Klagenfurt. 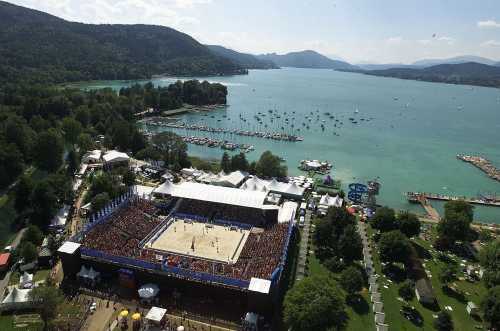 Since 1996 this event has grown into one of Austria's most successful sporting occasions, and this was recognised by the FIVB in 2001 when it awarded Klagenfurt the Beach Volleyball World Championships. In the same year a leading Austrian magazine voted it their "best event" ahead of the world-renowned downhill ski race in Kitzbuehel and the Formula One Grand Prix. And who can argue? With a stunning setting on the edge of Lake Worther - a popular holiday resort near the border with Italy - the Austrian Open is a magnet for the fans. More than 100,000 turned out to watch in 2001, while last year over 8,000 packed the stadium on the final day. It's all about entertainment - both on and off the court. The trademark 'slow wave' - performed by fans to the tune of Austria's icon-status Blue Danube Waltz- is a sight in its own rite, while the interaction with players and organizers opens up the whole tournament to the audience. The 2002 Austrian Open, the sixth event on the 2002 women's Tour, is the third of four Grand Slam events on this year's Beach Volleyball World Tour and offers a combined prize fund of $600,000 for the men and women competitors.